THERE are many aspects about Ivanhoe Grammar School’s deals with Banyule Council that are questionable. It appears that the school is able to acquire land and to represent it as being part of its own land holding without any redress by members of the public. The school has acquired part of The Ridgeway for carpark facilities. Having lived on The Boulevard, I used that thoroughfare daily to go to school, visit friends and my grandparents in Russell St. There was also a track between Elphin St and The Boulevard, which has been acquired/ blocked by the school. There was clear demarcation (a fence) between the school property and the track and people used this as a thoroughfare between Elphin St and access to the Yarra and Wilsons Reserve. The school has also asked to have road access to The Boulevard from Russell St to alleviate its problems with parents picking up their children. Having lived on that section of the Boulevard I am aware that it is not as easy to navigate due to the sharp bends. The council is prepared to give IGS another 20-30 year lease of Chelsworth Park so the school can tell prospective clients it has magnificent playing fields in its prospectus. For an entity which doesn’t pay rates, to get such a deal appears overgenerous. It is ironic that rate payers will have limited access to that section of the Wilson Reserve/ Chelsworth park area. Surely the $2326 that I pay in rates gives me more rights to accessing that land. There also appears to be a subtle move by IGS to take over the tennis courts, so once again the public, who paid for these, are forced out. I believe that the payment to the council will be $50,000 in the last 10 years of the lease. Carey and Trinity had to pay for their land, then maintain it as well as bus students to their facilities. So what was wrong with IGS using the land they had in Morang to develop their own sporting facilities? For an organisation to be able to tie up such public space and then be able to dictate when others can use it, Banyule rate payers should be entitled to greater compensation. For this privilege the school should be paying far more than is being mooted. IGS will, of course, argue it is maintaining the playing fields. This is true, but that is so the school can run its inter-school AGS schedule there. As an “elite” school they would have that cost anyway, no matter where their grounds were. This area was a wetland and to many, that is more appealing than neatly-mown grass. I ask that the council reconsiders the conditions of the lease so it is more favourable to rate payers. After all it is public land. It belongs to the Banyule rate payers. 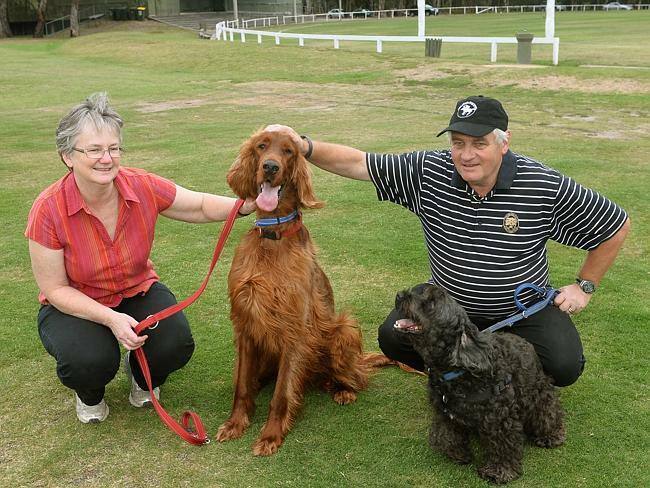 A VIDEO on behalf of the dogs of Chelsworth Park has emerged as lease talks continue between Banyule Council and Ivanhoe Grammar School. The clip, We like Chelsworth Park …‘Just the way you are’, anonymously posted to Youtube on March 14, gives “the dogs of the Griffin Ward” their say on the future of the open space area. Ivanhoe Grammar School is undergoing negotiations with the council for another 30-year lease of the park after their 20-year lease — which was granted in 1994 — ran out. The dogs of Chelsworth ParkThe dogs of Chelsworth Park : Sue and Paul Simmons with their dogs at Chelsworth Park. Picture: Carmelo Bazzano. The clip, which has been viewed 170 times, is a scenic look at the sunny Ivanhoe park while Billy Joel sings Just The Way You Are. Throughout the video a number of messages by dogs flash across the screen about their favourite aspects of the Chelsworth Park. Ivanhoe dog owner Paul Simmons, who was not responsible for making the video, takes his dogs Spinner and Dougal down to the park for a run in the evenings. Mr Simmons said some residents were worried a 30-year lease to the school would mean public access would be limited despite the council’s assurances it would not change once the new contract had been signed. “Given that the school wants to increase its numbers I assume the school will have more need to use Chelsworth Park,” Mr Simmons said. Fairy Hill Ivanhoe community group member Robyn Roberts said the expected future population growth in Ivanhoe and surrounding suburbs meant there will be a higher demand for public open space. “There is higher demand for walking and exercise at Chelsworth, not only because it’s pretty but because it’s well connected to other walks,” Ms Roberts said. Banyule Council spokeswoman Fiona Athersmith said the park will remain open to the public for leisure activities and community enjoyment outside of the existing license arrangements with community sporting clubs and casual bookings. Ivanhoe Grammar School Principal Rod Fraser said the school was working with the council on the lease. “The school continues to work with the ... council in regards to the Chelsworth Park lease and all matters associated with it,” Mr Fraser said. BURGLARS are targeting commercial buildings in Nillumbik, breaking into three sports clubs in the past month. Banyule CIU detective Senior Sergeant Kevin O’Connell said there had been a spate of burglaries from non-residential buildings with burglars taking cash and whatever small items were of value. He said the Plenty Cricket Club was burgled between January 21 and 23 and the Eltham Bowling Club between January 21 and 22. Research Tennis Club was hit on January 22. The air conditioners were stolen from the Hurstbridge Family Centre, which is under construction, between January 17 and 20. There were also attempted burglaries at a supermarket in Diamond Creek and a milk bar in Eltham. “We think these are linked to them because of the nature of the buildings,” Sen-Sgt O’Connell said. “They are all overnight jobs. Anyone with information is asked to phone police on 9450 8000 or Crime Stoppers on 1800 333 000. TWO Banyule sporting clubs and a construction site were robbed in what police believe was a one-night crime spree. The East Ivanhoe Saints Cricket Club, Eaglemont Tennis Club and a temporary building next to a building site were raided by burglars on the night of Thursday, February 21. Heidelberg police Constable Chris White said he believed the three incidents were linked. Constable White said the first incident happened at the office of a construction site next to the tennis courts at Chelsworth Park, between 4pm on the Thursday and 7am on the Friday. He said offenders used a spanner to open a window and stole a Nikon camera. The second incident happened at the nearby East Ivanhoe Saints Cricket Club with offenders forcing open the front door between 9pm on the Thursday and 8.30am on the Friday. Constable White said they used a drill to unscrew the door of a glass fridge which was holding a cash register. A total of $500 was taken from the register. Finally, burglars broke into the Eaglemont Tennis Club between 7am on the Thursday and 6.30am on the Friday. He said nothing was taken but offenders got in through an unlocked door and ransacked the building. Anyone with information should phone Crime Stoppers on 1800 333 000 or Heidelberg police on 9450 8000. If the sportsclubs - on Council Land, were not allowed to hold cash overnight - there would be no temptation for break-ins.